A Rhine River cruise is a wonderful experience indeed. Prepare to see ancient castles and lush vineyards, explore the winding streets of sleepy medieval villages and revel in the historic grandeur of lovely old cities. One of the best ways to explore it is at a handlebar level, using your bike to explore the region at your own pace. Visit all the highlights of the legendary Rhine River on this week long bike and barge adventure. You will see the many charming castles that command the riverbanks as you travel through Germany. 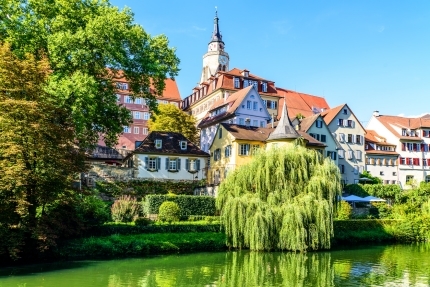 Take in historic Germany, the quaint towns, fortresses and the unique architecture. Explore the lush landscape, with bountiful farmlands and vineyards along the river. Take in a wine-tasting and enjoy all the local flavors. You can choose to ride with the group, or at your own pace, or simply stay on board and watch the world go by. Engage your senses, hearing the cathedral bells chime the hours as you float by.